Inflatable dinosaur costume is a blow up costume that makes wearer look like a dinosaur or riding one. How do blow up dinosaur costumes work, or how they are being inflated? It’s because every suit has an inbuilt fan, after you put yourself in, connect the fan to battery operated powers attached to your pants, zip up and have fun. Inflatable dinosaur costume includes inflatable riding dinosaur costume and inflatable t rex costume. They can be worn by adults and kids, men and women, boys and girls, for Halloween, parties, cosplay, festivals or simply for fun. It’s already extremely funny to wear an inflatable dinosaur Halloween costume, not to mention along with dancing, jumping, running and other actions. 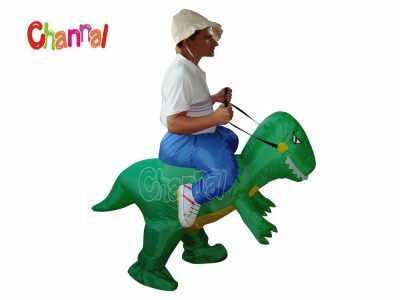 Channal Inflatables is a professional inflatable dinosaur costumes manufacturer in China. 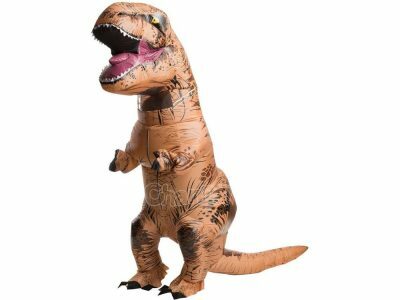 We always have well made inflatable dinosaur costume for sale and wholesale at a cheap price. Wholesale orders get more discounts.